Synopsis: Coco (Hendler) has just moved to a new apartment with his wife Pipi (Stuart), who’s seven months pregnant. At first, they don’t seem to notice the growing chaos around them, but when authorities quarantine their building after a deadly pandemic breaks out, Coco joins forces with his off-kilter, but well-prepared and stocked next-door neighbor Horacio to defend his refrigerator and keep Pipi safe. Meanwhile, outside the building, Buenos Aires—and the world as the apartment denizens know it, is disappearing. The world is ending; got ammo? 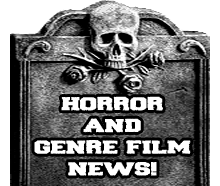 Review: Know the saying never judge a book by it's cover well this is one of those cases because this film has some very badly done artwork that I would normally pass up, but what lurks on the DVD is way better than it would appear. 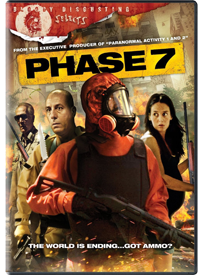 On the back it says Phase 7 is a mixture of "Shaun of the Dead Meets [REC]" which is kinda true in the aspect that it is about a virus breakout and a group of people are quarantined in an apartment building with some humor thrown in, but Phase 7 is actually more than just that and actually touches on some political issues at the same time. Mainly talking about the New World Order which is something that could happen and how Phase 7 is a plan that the N.W.O. would use to regulate the population of the world with a virus. Also it shows like a few films I have seen before of how humans will be friendly one minute but when they need to be friendly and helpful the most they turn on one another to survive. For the most part this film sticks to being more serious than you would assume due to the comparison on the back, there is some humor thrown in from time to time but it's nothing really like you see in Shaun of the Dead, I guess I am trying to say it's a little more subtle. Now as far as the characters go you really can only count it as having 4 main characters and the rest are supporting cast that get taken out early or just really aren't in the film all that much. You get a younger couple that consists of Pip a pregnant woman who doesn't see the situation as that bad and Coco her naive husband that quickly changes his view after seeing what is truly happening around him, Horacio a very ready an intelligent neighbor who most look at as very paranoid but turns out to be wise about the situation at hand, and Zanutto a old man ready to defend himself no matter what the cost. Overall great cast of characters that work great with and against each other perfectly. As far as the pacing goes it stays steady from the start to the finish with the occasional slowdown but not to the point where you will become bored. You do get some character development so you probably will connect with characters in ways that will get you more invovled with the film. One little thing I must point out is that I loved that the character Coco was wearing a S.O.D. shirt for a little bit in the beginning which was awesome in my opinion. Overall this film was great and definitely is better than one would suspect from seeing the DVD artwork, if you want a good outbreak or virus film with a tinge of humor than I say give this one a shot!